Sunday afternoon was a necessary win. The San Antonio Spurs defeated the Golden State Warriors 103-90 and lived to fight another day. It was the culmination of a thousand emotions, shared by a team, an organization, and a fan base which hasn’t been in this situation in the last two decades. Our team probably won’t win the series, although the way this season has gone, would it surprise you if they did? 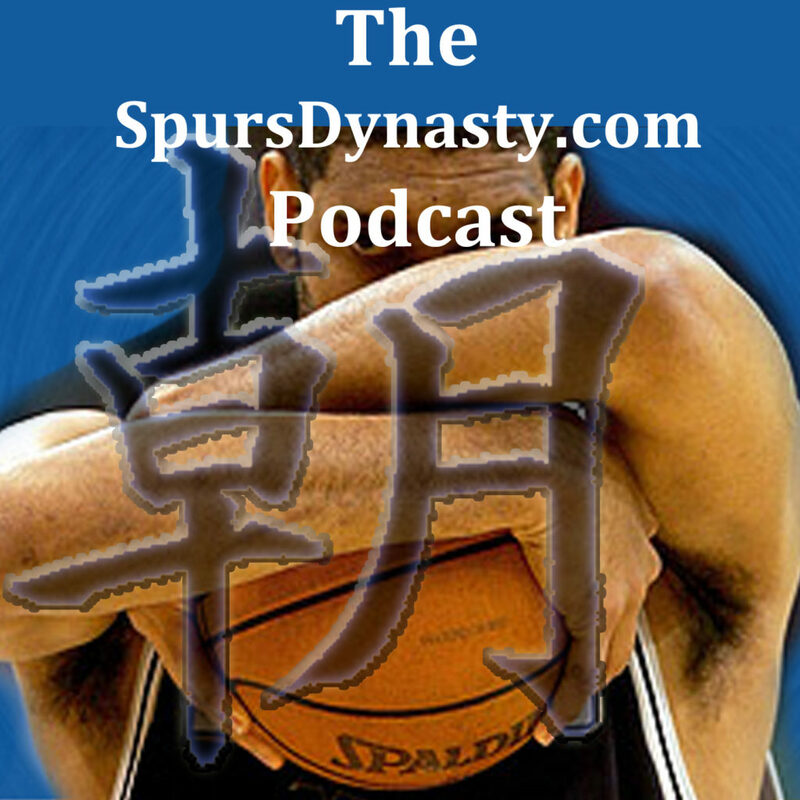 I predicted during the series preview episode of the SDP that the Spurs would win game 4 before being eliminated in game 5. While I may have accurately predicted the destination, I could not have predicted the journey. Frankly, I don’t think anyone could have predicted how chaotic this season has been, let alone this playoff series. Well, that was a fun game. 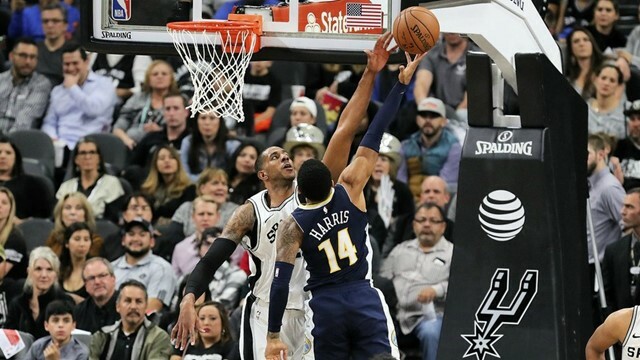 The Spurs finished survived a last second heave by the Denver Nuggets and held on to win their 34th game of the season. By all accounts, this game was great TV. It had dunks, three balls, Manu Ginobili playing like Manu Ginobili, technical fouls and for a large part of the game, some pretty bad defense. The Spurs put up 60 points in a first half where Kawhi Leonard and Rudy Gay sat in street clothes again. LaMarcus Aldridge was nothing short of dominant in the first 24 minutes, carrying 20 points into intermission. LaMarcus All-Star. He was matched up with Nikola Jokic for most of the night, with a few mouth-watering mismatches against Trey Lyles sprinkled in. While the 22-year-old Serbian has incredible vision and a super bright future, Jokic apparently is not very good at defending All-Stars from San Antonio. In fairness, not many people have been this year. LaMarcus has accepted the responsibility of being this team’s best player and last night was no exception. He was miles away the best player on the court and exploited the mismatches presented to him by a scrapping and entertaining Nuggets team. We probably don’t need to get into too many analytics of his game, but for kicks and giggles, let’s summarize it in a sentence. LaMarcus Aldridge had 30 points in 38 minutes on 14 of 23 shots. It’s no James Harden, but that’s pretty good. If we were to nitpick his game, it would be in the area of rebounding, as he finished with only five. That would be concerning, except for the fact that DeJounte Murray had 13 rebounds. I mean, when you get that kind of rebounding effort from your 20-year-old point guard, you can accept five from your power forward. Speaking of Sweet Honey DeJounte, was this game made for him or what? He really thrives in track meets against teams like the Denver Nuggets. Denver is in a bit of a holding pattern, having stopped their downward spiral, but not quite mature enough to begin their upward climb to being a good team. So they run…a lot. And they are athletic. I’m pretty sure Torrey Craig, Malik Beasley and Will Barton have pogo sticks for femurs. They were all over the place, but so was DeJounte. He thrives in these types of games. And so does Kyle Anderson. It’s no secret that he’s slower than molasses in February, but as Sean Elliot mentioned numerous times, just when you think he’s in jail and about to turn the ball over, his YMCA old man game kicks in and he leaves us all chuckling to ourselves. Kyle finished with a career high in scoring, notching 18 points on 9-of-12 shooting. He also played 34 minutes, which is evidence that he is getting the full Kawhi shift. And he deserves it. He won’t get the award, but Kyle Anderson should be a candidate for Most Improved Player this year. Lastly, the Spurs would not have won this game tonight without Manu Ginobili. I’ve run out of things to say about him. He defies logic. It can be an around the back pass to Davis Bertans, or a rainbow three pointer, or a block on Trey Lyles in the fourth quarter, but Manu is going to compete and he’s going to entertain in the process. I realize that there are a lot of people who have mixed reviews about the way Pop has handle the Kawhi situation. That may be fair. But no one is talking about how Pop has managed a bench unit with two Hall of Famer’s on it. Tony Parker, reunited with his old running mate, is thriving on the bench. He and Manu look like they are having fun. They typically hover around 20 minutes of playing time, but they get a different group of talent, they get a different wave of game flow, and most of all, they are probably working with the best chemistry on the team. I don’t know if it’s possible, but if I were managing the Spurs Spanish Play-by-Play broadcast crew, I’d throw every dollar I own at Manu Ginobili after he retires and hope he becomes the Spanish version of Sean Elliot on the sideline. Pair him with Paul Casto. I forget how much of a global icon he actually is. His value goes beyond basketball and his charisma mixed with his basketball acumen would make him a fabulous color commentator for Spurs En Espanol. Kudos Pop. Kudos Tony. And Manu, Forever. There are rumors. And it’s up to you to choose what to believe. It’s one thing to believe Michael C. Wright and Adrian Wojnarowkski, but please don’t believe anything Stephen A. Smith says and tread lightly with Jalen Rose (believe me instead, I am way more credible!). The latest I’ve heard as recently as this weekend is “discord” is too strong of a word. Kawhi is not angry and doesn’t want to leave. But there has been a bit of strain on the relationship due to the injury. Apparently, the Spurs felt Kawhi was ready to go. But Kawhi, who is young and has an entire career ahead of him, including the potential for a super max contract and maybe one more after that, is concerned about the possibility of reinjuring himself. So Kawhi, sought an additional opinion, outside of team doctors, which makes the Spurs scratch their head, and the two-time Defensive Player of the Year felt he should take a few more weeks to recover. Honestly, this makes sense, and is completely fair for Kawhi to feel that way. Like it or not, the NBA is a very different league in 2018 than it was when David Robinson played. Players now have bigger contracts at stake, but more so they have brands to maintain. Kawhi has a brand and frankly, the brand of Kawhi is in its infant stages. Jordan Brand took a risk and signed Kawhi Leonard to their line a few years back. That comes with a huge amount of pressure, as I am sure LaMarcus can attest (also signed with Jordan). With big name players like Carmelo Anthony, Chris Paul, Russell Westbrook, Blake Griffin and Jimmy Butler signed with Jordan, Kawhi has a standard he has to meet. He also has his personal brand he must continue to develop which carries with it endorsements and commercials and basketball camps and public appearances. Kawhi does have a responsibility to the Spurs, but the Spurs also have a responsibility to Kawhi. The NBA is a player’s league. Significantly more so than the NFL, but not nearly as much as the MLB. But since David Stern moved out of the office, Adam Silver has shown his intention to allow this type of behavior for players and rightly so. The Spurs are just slower in realizing that than most teams. And Kawhi really just fell in their lap. So they are learning on the fly too. As a fan, you can question his millennial-type behavior. I think it’s even understandable to question his toughness a bit. But if we are going to do those things, we can only do so with the understanding that this league is changed since 1999 and Kawhi Leonard is absolutely, unequivocally, without a doubt, a super star in the best basketball league on the planet, save Lithuania’s D-League. Kawhi deserves the chance to heal, physically and mentally. Missing 73 games out of 82 is a small price to pay for him being in the right state of mind when that super max contract is ready to be signed. This team is probably not winning a championship anyways. And God forbid the Spurs lose Kawhi Leonard in Free Agency, the odds of getting another player in the draft are few and far between. He presents you with an incredible player offensively and defensively, but he also attracts other talent. He’s bait. So give him what he wants. WHATEVER HE WANTS. If he wants to sit out the whole year, let him sit. I still think he and Rudy Gay return after the All-Star break and the Spurs win 23 of their last 25 games or so and everything will be fine, but what do I know. Spurs draw the short stick and get to be the first team to play James Harden after he dropped a ridiculous 60 points, 11 assists and 10 rebounds against the Magic. The Rockets are about four games ahead of the Spurs in the standings, so even though the standings won’t change much, Thursdays I-10 matchup should be a treat for everyone. In 46 games played so far this season, the Spurs have been without Kawhi Leonard for 37 of them. It looks like that trend will continue. Hours after Wednesday’s breaking news about Kawhi Leonard being shut down indefinitely with right quadriceps tendinopathy, the Spurs beat the Brooklyn Nets and retained their number 3 seed in the Western Conference. LaMarcus Aldridge led the Spurs with 34 points on 13-of-24 shooting in nearly 38 minutes of play. Aldridge was impressive from the start, but dominated the third quarter with 14 points, scoring at will. 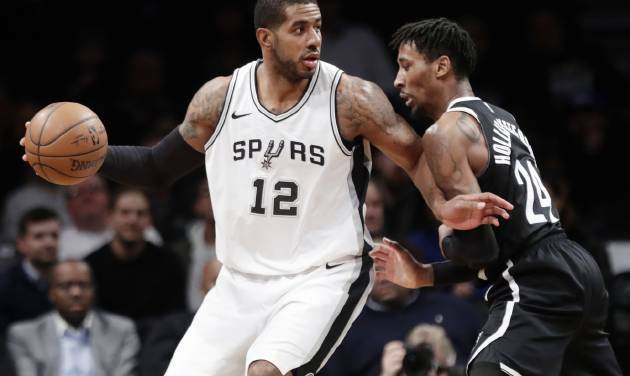 The Nets are young and play hard, but they had no match for the All-Star lock, as LaMarcus was able to shimmy, shake, pump fake, and dunk over pretty much any defender thrown at him in the second half. 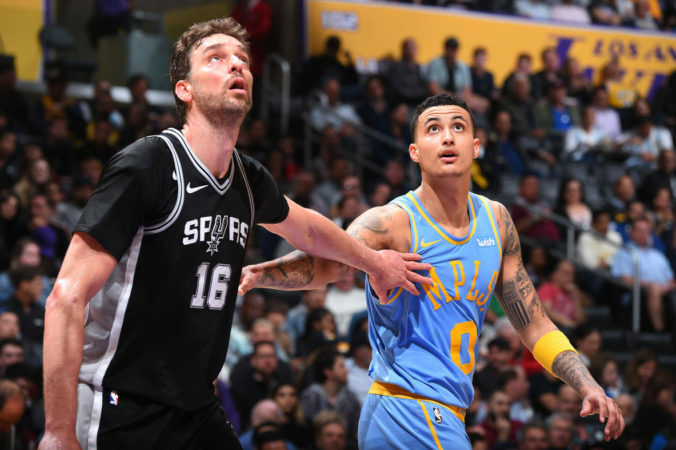 His performance was accompanied by his trusty side-kick and former Blazers teammate, Patty Mills, who hit a career best 7-of-8 threes on his way to 25 points on the night, helping the Spurs hit “100” and earn their 30th win of the season. Mills shot his way out of a slump and looked like the Patty Mills we all know and love. Danny Green is looking better by the day. Kyle Anderson has filled in admirably. Dejounte Murray is a monster on the glass. And while Pau Gasol continues to serve up Aldridge in the paint, Tony Parker remains the Spurs consistent playmaker. The Spurs will need Aldridge’s continued dominance and this version of Mills if they want to stay afloat without their best player. In an over-crowded cluster of runner-ups to the Golden State Warriors, the Spurs have found themselves on the wrong side of the injury report this season. My how quickly things can change. Just a short calendar year ago, the NBA, and quite possibly the world, was starting to bask in the revelation of just how good Kawhi actually was. Words like “MVP” and “Superstar” were being tossed around. Talk of Finals trips were commonplace amongst Spurs fans. Even the “LeBron to SA” rumors were out in full force. But alas, it was not to be. At least not yet, anyways. Kawhi rolled an ankle, we all lied to ourselves pretending the Spurs might have beaten the Warriors, and then we accepted this idea that, in 2018, when Kawhi is healthy, the Spurs can be that one team to upset them. Two months later, “quadriceps tendinopathy” was being googled by every Spurs fan from here to Buenos Aires. I’ve been critical of this new dynamic of Kawhi the Superstar. 2- Gregg Popovich doesn’t know how to coach a superstar. I don’t think Kawhi knows how to be a superstar and I don’t think Gregg Popovich really knows how to coach a true superstar. But in 2018, it’s all about protecting your brand, protecting the product and now, protecting the future. So this entire dynamic is new to them, and to Spurs fans. Players brands are just as important now as their jump shot. We’ve seen quite a bit of branding coming out of Kawhi since the end of last year. Tim Duncan and David Robinson were better than Kawhi, but weren’t nearly as talented. Both were expected to be great players and both had the spotlight shining solely on them. Kawhi kind of came out of nowhere and his emergence, while welcomed, seemed to have caught the organization off guard. You have to remember: the Spurs signed Aldridge and then suddenly, their defensive specialist turned into an offensive juggernaut. Frankly, I am glad to see Kawhi shut down and would like to see him shut down for the year. The injury to my understanding is more of a “wear and tear” injury rather than just a incidental one (like Tony Parker’s). And don’t get hung up on the word “indefinitely.” LaMarcus was out last year “indefinitely” with a heart issue. He missed three games and came back. I think there are one of two scenarios at play here. The first: the injury is super bad and he ends up shut down for the season. That’s my hope. Let’s punt this season, let LaMarcus run the show, and then start fresh next season. The other: keeping him out until after the All-Star break, which should bring back Rudy Gay and probably Manu Ginobili, all in one motion. This is a good point in the season to buy an extra week of recovery for players with lingering ailments. As much as I’d want to see that punt, having this team roar out of the All-Star break and win 20 of their last 25 isn’t a bad alternative. There will be good and bad in this, but if the Brooklyn game is any indication, the Spurs aren’t as bad off as we may think. LaMarcus is still a really good player. Maybe a top 20 player in this league. And Popovich is a really good coach. Spurs fans should certainly raise eye brows in concern, but I don’t think panic is the right response yet. We’ll see who decides to fill in for Kawhi again in Toronto on Friday. It should be a good test. 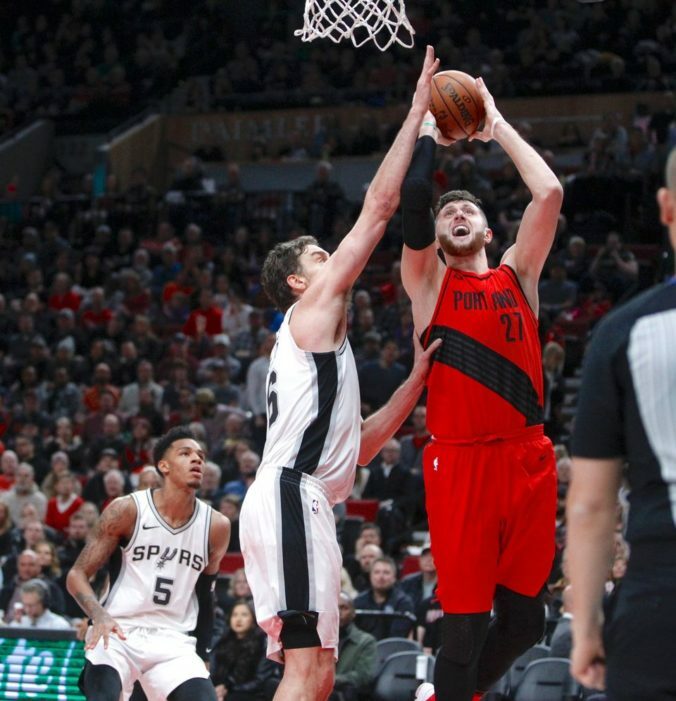 The Spurs fell in splendid fashion to the Portland Trailblazers on Sunday night after CJ McCollum tossed in some junk in the final seconds of a back and forth game. The 1-point loss to the Spurs was a perfect ending to a fairly entertaining game in which the Spurs could have probably used one more possession. The Spurs led in pretty much every category. They had more rebounds, both offensive and defensive, had more assists, shot better from the line, shot better from the arc, and committed less fouls. Unfortunately, they also had more turnovers. 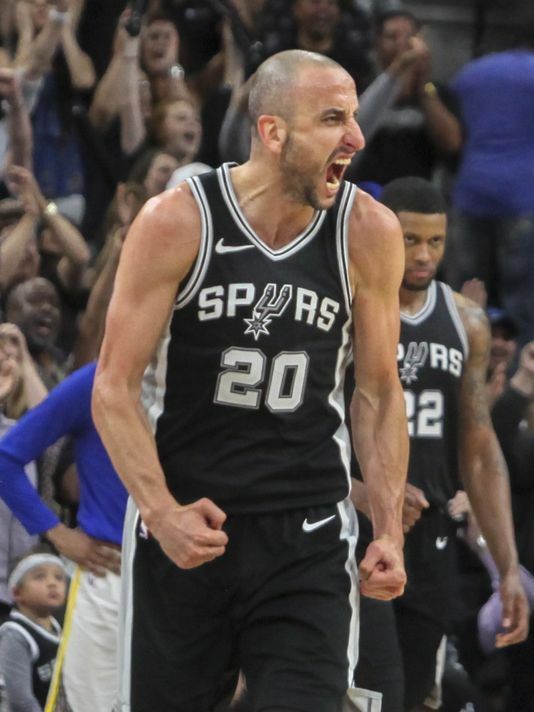 Late game heroics by Manu Ginobili, who has been nothing short of inspiring, as well as the continued dominance of LaMarcus Aldridge, was once again overshadowed by a chaotic whirlwind in the backcourt. Kawhi Leonard aside, this team is vastly different, sans Tony Parker.